I had a little bit of free time yesterday and decided to use it to just stamp for fun. I don't do that nearly enough these days and I'm determined to fit that back into my schedule. I took my inspiration from this week's CAS(E) this Sketch! challenge. 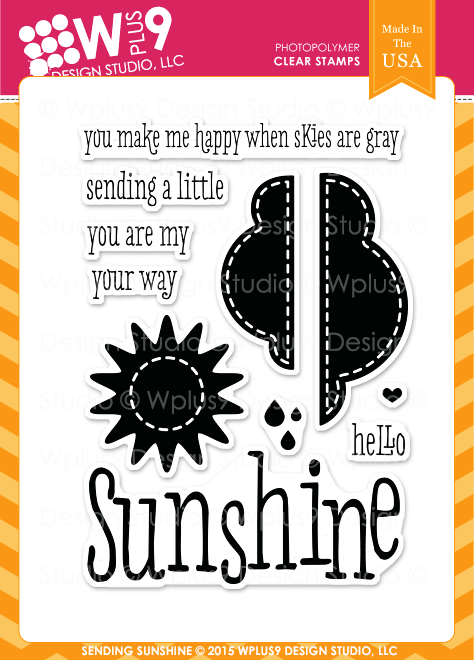 It gave me the perfect opportunity to use the new WPlus9 Sending Sunshine stamp set and the Sunshine Layer Dies. 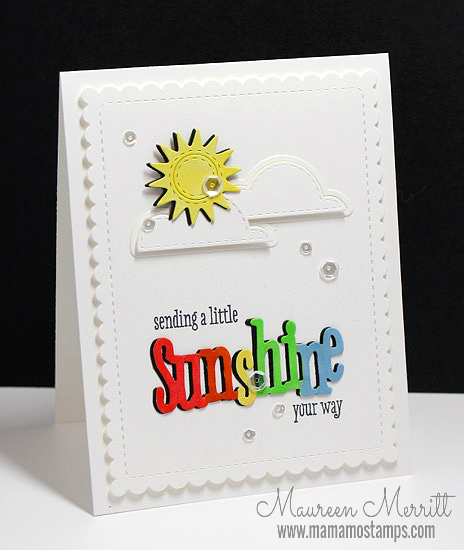 I have a family member that could use a little extra sunshine, I hope this card brightens her day! Make sure you pop in over the next week, I have TONS of posts scheduled so stay tuned! I recently got a request for birthday cards and found that I don't have nearly enough in my stash. 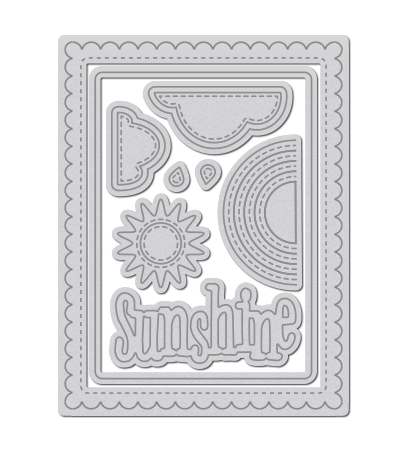 Penny Black's Bright Wishes stamp set is the perfect set to make birthday cards quickly and easily! 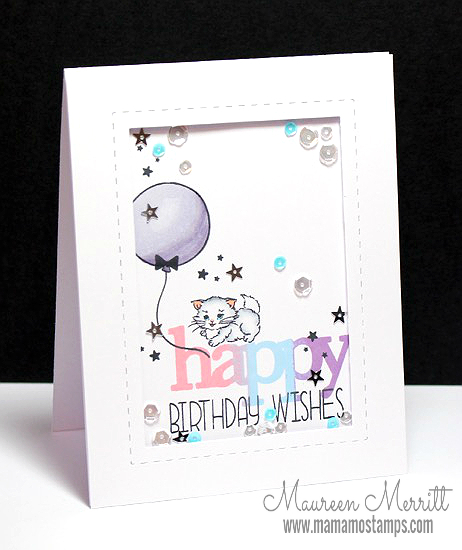 I stamped the Bright Wishes stamp repeatedly along the bottom portion of a 4 x 5 1/4 " piece of white card stock. Next I colored the candles with Copic markers, no blending, just straight coloring. 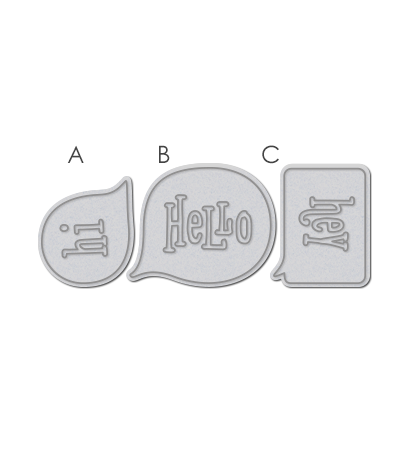 I die cut the Tagged label from the stamped layer as well as a piece of purple card stock. 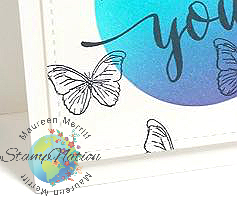 I heat embossed the birthday sentiment from Special Wishes with white embossing powder and inlaid it into my card. For a little added detail I colored over the candles with Wink of Stella and tied the top with black and white twine. 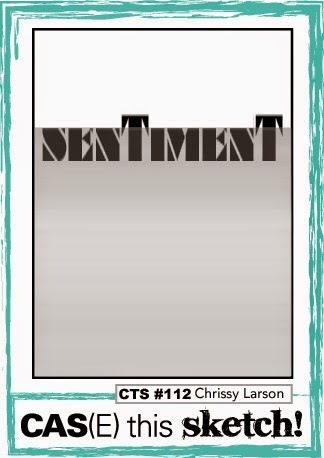 This card is perfect for mass producing (if you don't mind some coloring) and perfectly flat for mailing! 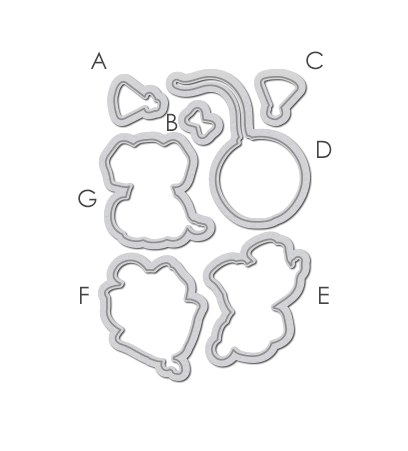 Looking for more ideas for the Bright Wishes stamp set? Download my free App, CAS Birthday. There you will find a Clean & Graphic Birthday card using Birthday Wishes! Heather North has taken over planning the challenges for me over at StampNation. 3 years, 150+ Challenges and every event, I was all out of ideas. Heather has brought our challenges to life with fun, fresh and different ideas. I'm thrilled that we asked her to take over. This week is a Tic-Tac-Toe challenge. For me, this was most definitely a challenge. After lots of crumbled paper I came up with something I was happy with. The Rock & Roll technique is the first technique I learned and it's one I turn to time and time again! 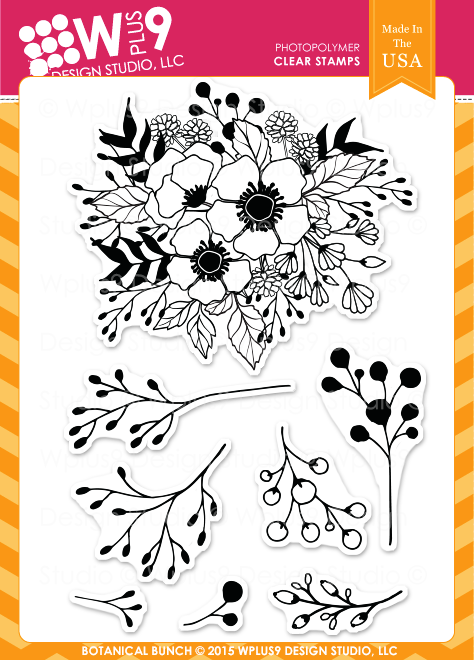 I especially love using it on leaves in the Fall and flowers, it gives bold images such a realistic look. Here I stamped the flowers from Penny Black Petal Power in Sweet Nectar ink and then rolled the edges in Sweet Gelato. I did the same with Mojito and Appletini inks on the leaves. 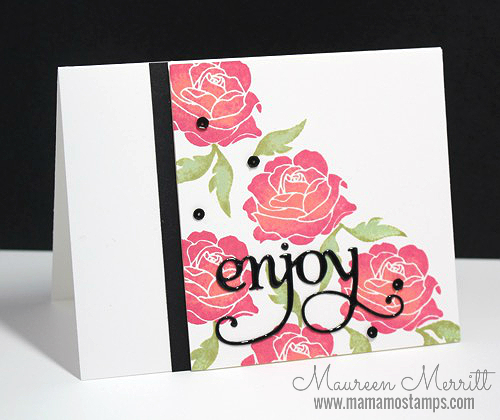 The "enjoy" sentiment from the Penny Black Hooray die set was cut from black card stock and covered with Glossy Accents. I love how that really makes a word die cut really pop! With the frigid temperatures in the Northeast I thought it was time to visit the beach!!! 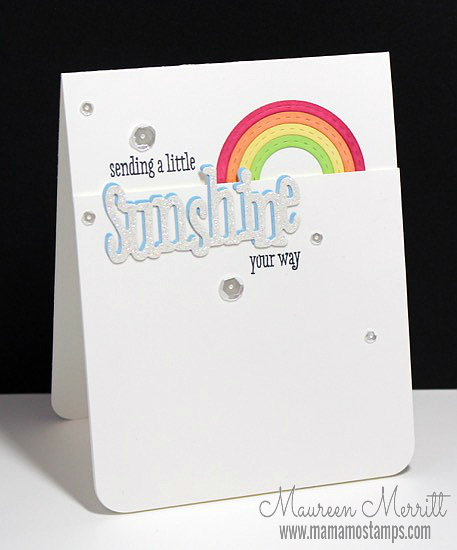 This month I'm featuring the Guiding Light stamp set and dies & Guiding Light Sentiments. We've been working on this for months and I'm thrilled that the doors for this class open TODAY! In Technique Toolbox: Creative ways to use dye ink pads, you'll find more than 20 video tutorials, 35+ samples and written tutorials all to teach you how to make the most of your dye ink pads. CLICK HERE TO LEARN MORE & TO JOIN NOW!! Not only do you get access to the class with your purchase, plus the free download, there are prizes and a coupon code to Ellen Hutson for class attendees as well. Click here to register, I hope to see you there! 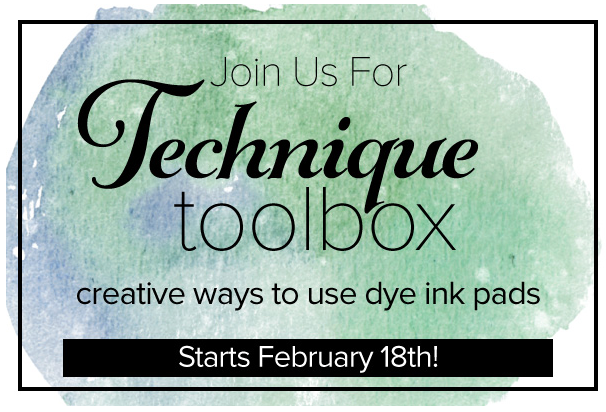 We are really excited to announce our next class which is all about Dye Ink Pads! 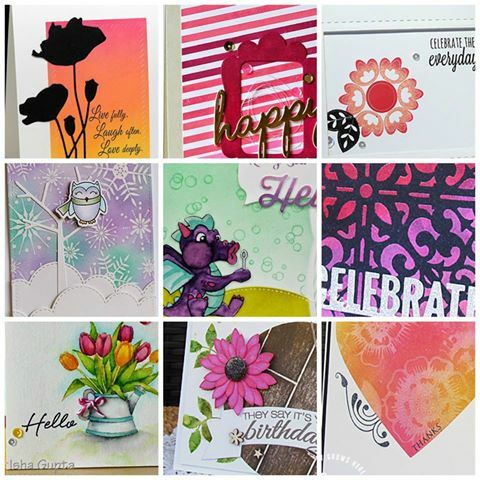 Ink pads are the most important tool stampers own and some of the most versatile. 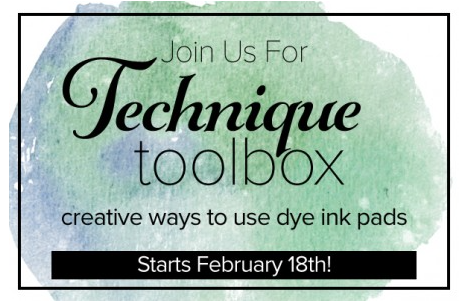 This class will teach you how to make the most of your dye inks. Registration begins on Tuesday, February 17th (TOMORROW!) for StampNation members with a $10 discount code! General registration opens on Wednesday. 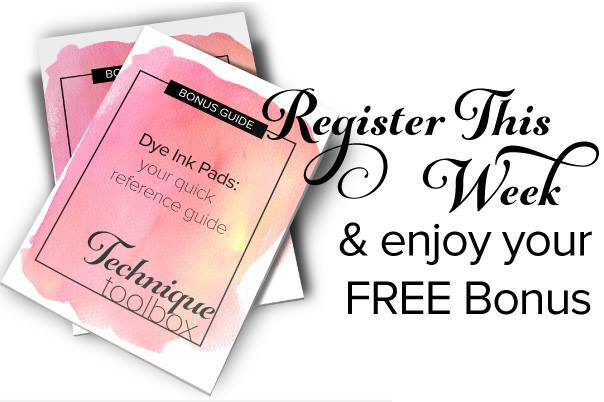 Sign up in the first week and receive a FREE (downloadable/printable) Quick Reference Guide for Dye Ink Pads (see below)...this alone is worth the price of the class! 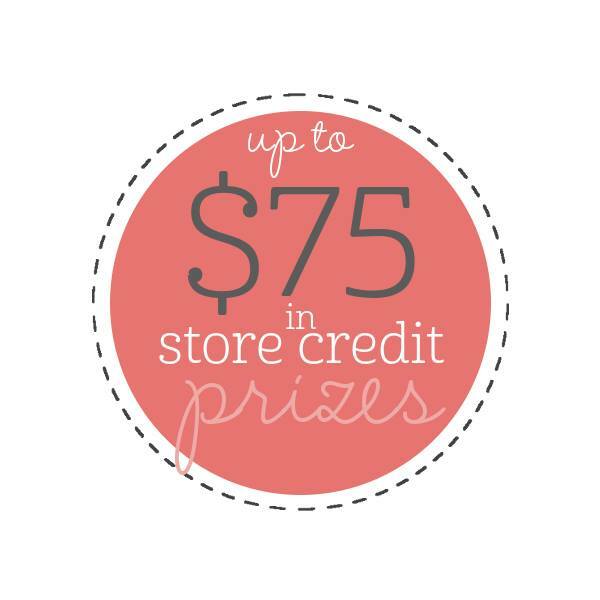 Class attendees will receive a discount code to shop at Ellen Hutson through Feb 24th. Class attendees will also be in the running for some amazing prizes!! 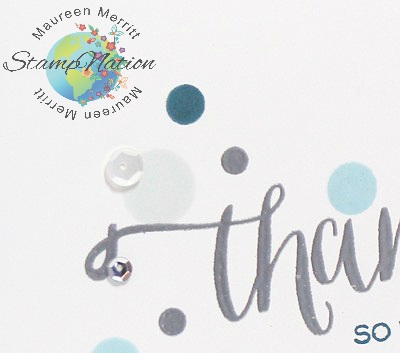 I truly believe that all stampers should join this class, it is an amazing resource! There are so many techniques available right at your finger tips. The downloadable PDF is a must-have, so make sure you join us in the first week, you don't want to miss out on having this reference guide. I'm seriously going to print one for myself! *This is my second post today, please scroll down to see my Virginia's View Challenge post. 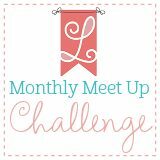 I'm so excited for the new Lil' Inker Designs Monthly Meet Up Challenge. 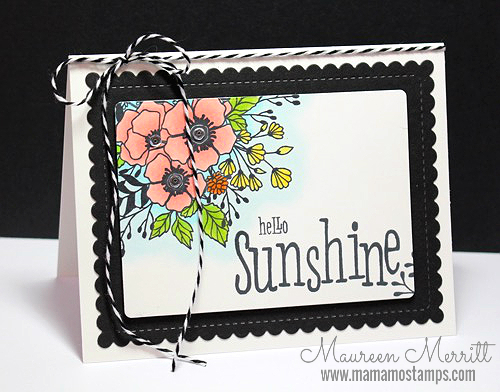 It's an easy, low key, anything goes challenge using Lil' Inker products! Link your project to our challenge by using the InLinkz tool on the Lil' Inker Design blog. I sure hope that you will play along! The more entries, the bigger that prize!!!! 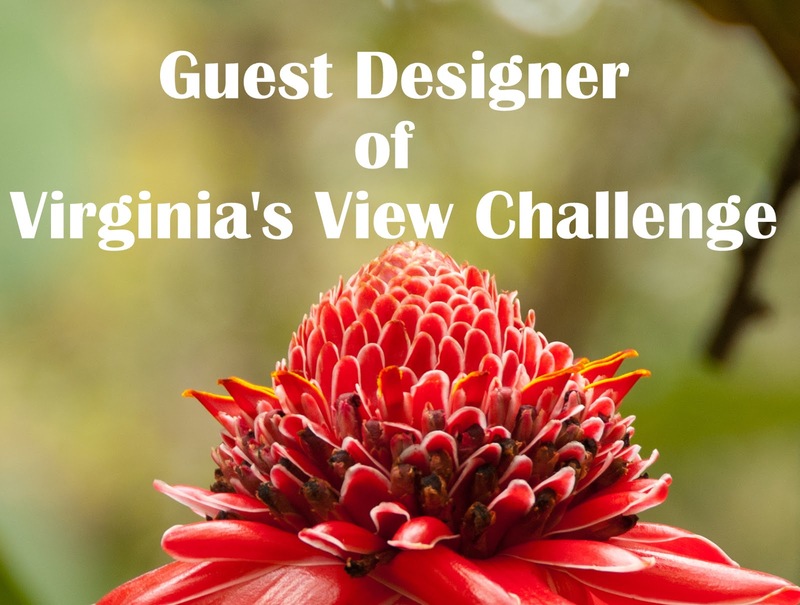 I'm thrilled to be a guest designer for the Virginia's View Challenge! This month Pretty Pink Posh is the sponsor so some of the PPP designers are joining in the challenge. Guess what the theme is...Shaker Cards, of course!!! I couldn't resist using the cute ellie from WPlus9's new release Unforgettable! My card features the new Pretty Pink Posh Silver Shimmer Seed Beads. Aren't they fun! 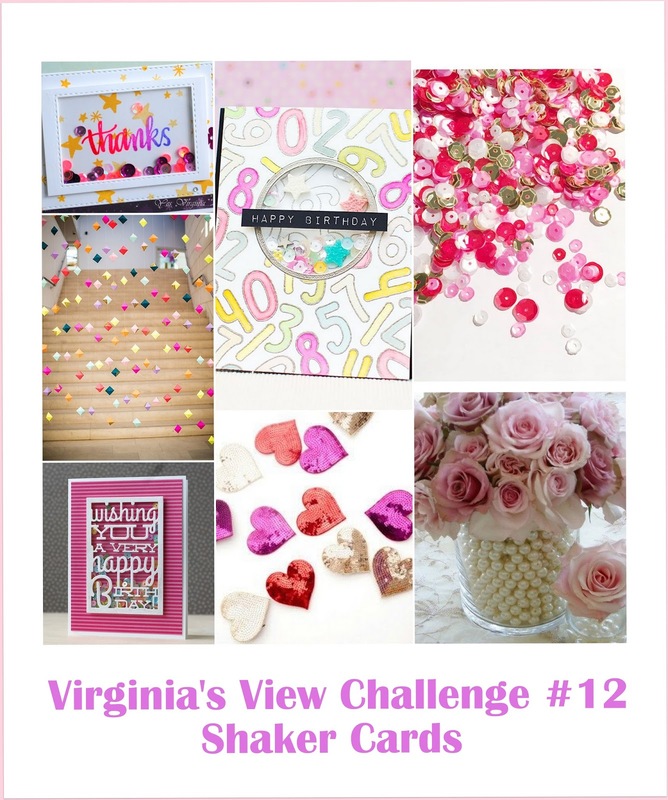 Head over to Virginia's View Challenge to see more shaker cards with designs tips to get your mojo flowing! The WPlus9 February release is available NOW! I have one last project left for you. I've been saving this one for the end because, well, I'm not so sure I like it. I love the idea but...something isn't right. 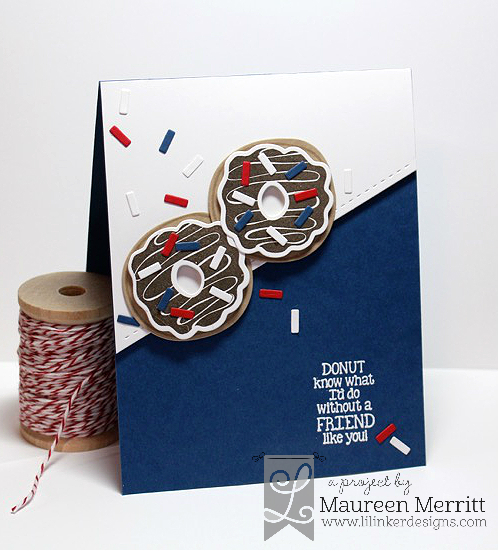 Again I had Kare Mail for Kids on my mind when I was creating this card. 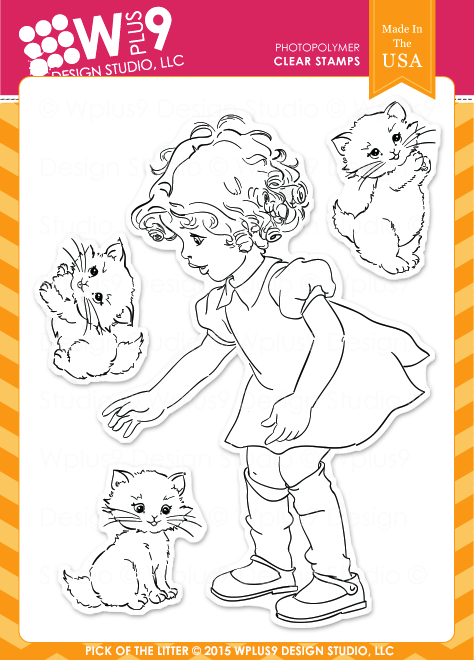 I thought that sweet kitty from Pick of the Litter would be so cute on a birthday card for kids! I inked the "Happy" stamp from Whole Lotta' Happy first in Little Piggy, then I flipped it over and stamped in Bo Peep ink. Next, I wiped off the end of the stamp and inked with Cockleshell. I love these soft pretty colors! This started out as a OLC, but I decided on a Faux Shaker instead. I'm obsessed with that look right now. I die cut a frame using the Holiday Aperatures Die set and added 4mm and 6mm Sparkling Clear, 4mm Aquamarine and Silver Star Sequins by Pretty Pink Posh. That's it from me. I hope you've enjoyed my release posts! It's release time at WPlus9! I've had a blast creating with all of the new products and I'm excited to share my projects with you. Today's card features a new stamp set called Unforgettable as well as two new ink colors from the Storybook Collection, Beanstalk and Bo Peep. The elephants in Unforgettable are just too cute. I can see myself using them a ton! 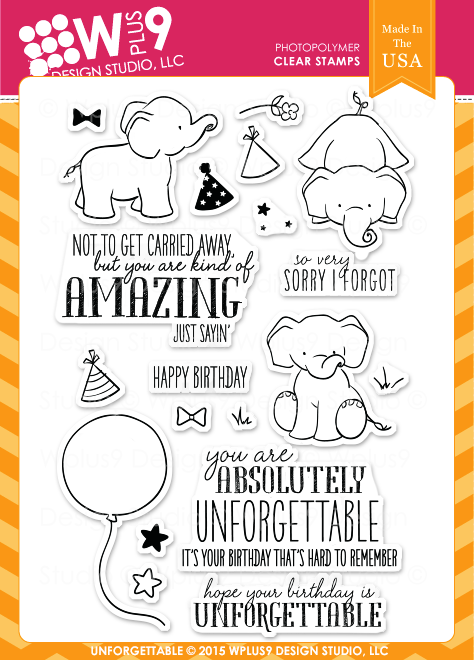 They are perfect for Kare Mail for Kidz, birthdays or just to send a smile just because. To make my card, I started by coloring the elephant with Copic Markers (C01, C03, C05, R00). I then die cut him and placed him on a heart that was first stamped and then sponged with Bo Peep and Beanstalk dye ink. 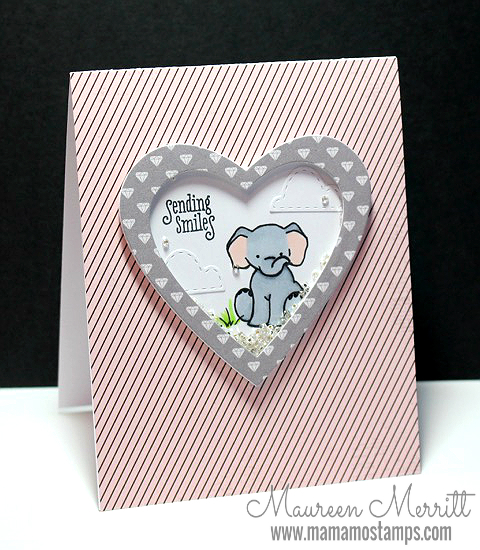 I stamped and fussy cut a sentiment from Bubble Talk and placed in behind the elephant which was added with dimensionals. 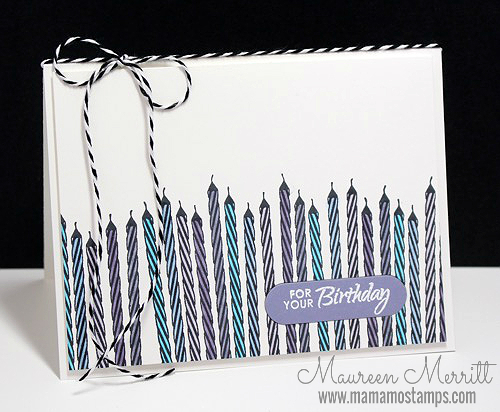 The background was stamped in the same inks using the Borders & Backgrounds 1 stamp set. Head on over to the WPlus9 Design blog to see the full reveal and amazing samples from Dawn! You can also visit Joni and Kara for even more WPlus9 inspiration.